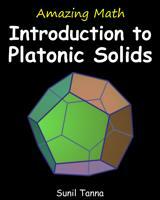 This book is a guide to the 5 Platonic solids (regular tetrahedron, cube, regular octahedron, regular dodecahedron, and regular icosahedron). These solids are important in mathematics and nature, and the only types of convex regular polyhedra that exist. An introduction to some other interesting types of polyhedra - prisms, antiprisms, Kepler-Poinsot polyhedra, Archimedean solids, Catalan solids, Johnson solids, and deltahedra. Note: Some familiarity with basic trigonometry and very basic algebra (high school level) will allow you to get the most out of this book - but in order to make this book accessible to as many people as possible, I have included a brief recap on some necessary basic concepts from trigonometry (such as sine, cosine, radians, etc.). This book is now available as both a printed book, and as an electronic book on Amazon Kindle!